A reenactment of the arrival of the Gonzales 32. The Alamo will host Commemoration, 13-days of special events and programming to honor the defenders who gave their lives in the 1836 Battle of the Alamo. From Feb. 23 through March 6, we will host over 30 events, many of them free to the public. Our commemoration programming includes reenactments of historic moments, panel discussions with renowned historians, movie screenings, live music and more. Watch some highlights from our 2018 Commemoration programming. We will have unique living history demonstrations every day during Commemoration. As always, demonstrations in our Living History Encampment in the Alamo Gardens are interactive and fun for the whole family. At 4 p.m. daily, a member of the Alamo garrison will read a historic text that describes what is happening at the Alamo during each day of the siege. With dozens of events planned for this year’s Commemoration, there are simply too many to list. Below is just a selection of some of our Commemoration programming that we invite you to. For a full list of Commemoration programming, visit this link. · Feb. 23, 10 a.m. — La Gran Marcha del Ejercito Mexicano — Witness the arrival of the Mexican Army in a recreation of this pivotal moment in Texas History. This event is free to the public. · Feb. 23, 10 a.m. — An Evening with Heroes — What would it have been like to be present at the Alamo during the siege leading up to the battle? Join the Alamo for a special, after-hours theater where you will witness the events and conversations that took place the evening before the final attack. · Feb. 24, 10 a.m. — Never Surrender or Retreat — Watch a reenactment and reading of the Travis letter, as Colonel William Travis’ call for reinforcements is to be delivered across Texas on horseback by courier Albert Martin. This event is free to the public. · Feb. 28, 10 a.m. — Historians Speak — Hear historians Miguel Soto (Universidad Nacional Autónoma de México), Andrew Torget (University of North Texas), Gregg Dimmick (author) discuss the state of scholarship on the Texas Revolution. This event requires registration. · Mar. 1, 10 a.m. — The Immortal 32 Arrive! — On March 1st, Travis’ plea for reinforcements is answered by 32 men from Gonzales. This special recreation of the arrival of the Gonzales 32 is free to the public. The Mayor of Gonzales, Connie Kacir, will be our guest of honor. This event is free. · Mar. 1, 6:30 p.m. — Movie Night at the Alamo — The Alamo will host a special screening of a film adaptation of the Battle of the Alamo in the beautiful Alamo gardens. This event is free to the public. · Mar. 2, 12:30 p.m. — Commemoration Ceremony: Texas Independence Day — Presented in partnership with the Mission Chapter of the Daughters of the Republic of Texas, this event commemorates Texas Independence Day. This event is free to the public. · Mar. 3, 10 a.m. — 5 p.m. — Crockett Fiddle Fest — The Alamo’s annual Crockett Fiddle Fest returns with a full day of live music from renowned fiddlers and country music bands. This event is free to the public. · Mar. 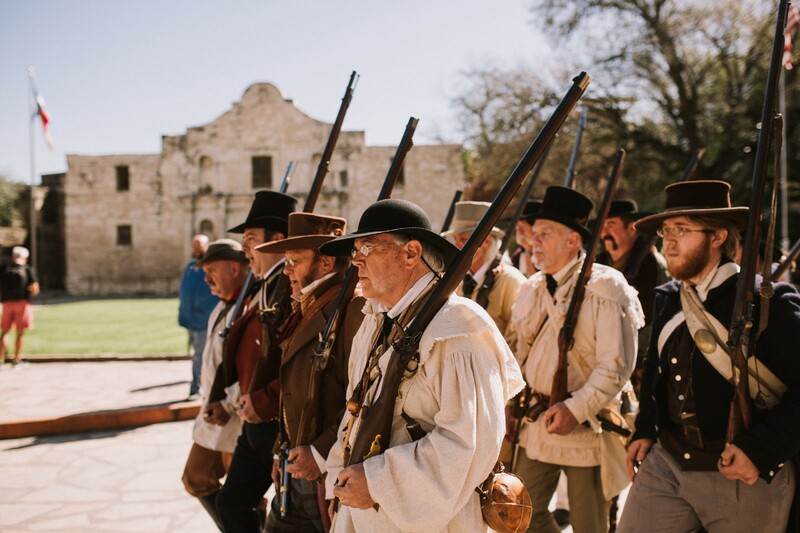 6, 6 a.m. — Dawn at the Alamo — In partnership with the San Antonio Living History Association, Dawn at the Alamo describes the events leading up to the morning of the battle. This event is free to the public. · Mar. 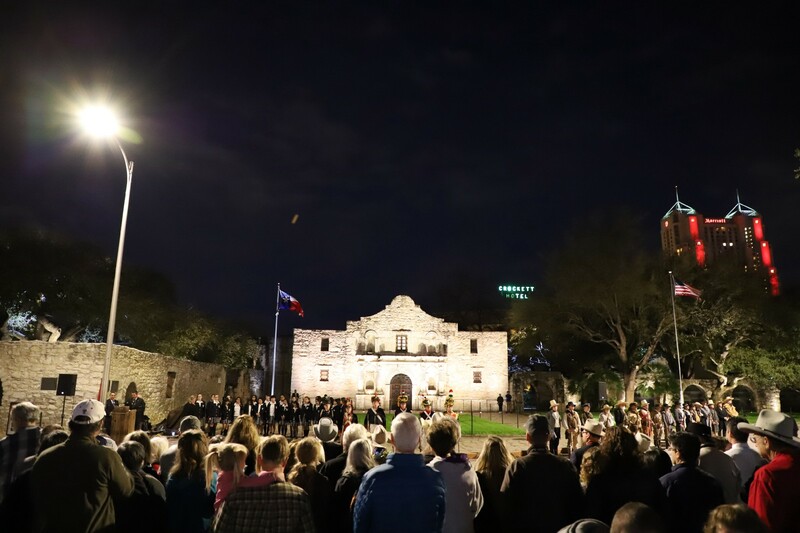 6, 10 a.m. — Commemoration Ceremony — In partnership with the Sons of the Republic of Texas, this event commemorates the 1836 Battle of the Alamo. This event is free to the public. · Mar. 6, 2 p.m. — Memorial Service for the Heroes of the Alamo — This program, presented in partnership with the Alamo Mission Chapter of the Daughters of the Republic of Texas, honors the heroes of the Alamo who valiantly fought and died on March 6th. This ceremony will feature a roll call of the nations and states where each defender came from. This event is free to the public. · Mar. 6, 6 p.m. — Remember The Defenders — This poignant ceremony honors the sacrifice that the Alamo defenders at the Battle of the Alamo in the name of Texas’ independence. This event is free to the public. Photo: Dawn at the Alamo Ceremony, March 6, 2018. Commemoration is the most important time of the year for the Alamo. Our goal with our annual Commemoration programming is to teach visitors more about the Texas Revolution, and the Battle of the Alamo. Over 50,000 people visited the Alamo during Commemoration in 2018, learning more about our site’s dense history. Whether it’s the Mission period (1700–1793), the Spanish military period (1794–1821), the Mexican Revolution and Republic of Mexico period (1822–1835), the Texas Revolution (1835–1836) or the modern era (1906-present), the Alamo has a diverse history. This history teaches us why the Battle of the Alamo happened, the impact it had on the region, and why we should always Remember the Alamo. We hope to see you during Commemoration.